Iconic director William Friedkin returns to the big screen this week with Killer Joe, his first feature since 2006’s Bug. The director of classic films like The Exorcist and The French Connection this time around brings us an extremely dark comedy of a murderer for hire that goes wrong in almost every way. Killer Joe may also be the film that brings us the most compelling performance in McConaughey’s career as the titular Joe. After losing two kilos of drugs from a local supplier, Chris Smith (Hirsch) hatches a plan to get the $6,000 he owes to save his life. Enlisting the help of his father, Ansel (Church), mother-in-law, Sharla (Gershon) and sister, Dottie (Temple), Chris lays out the particulars of his nefarious scheme. You see Chris and Dottie’s mom, Ansel’s ex-wife, has a $50,000 life insurance policy that is all in Dottie’s name. Not having the fortitude to execute the deed of killing her themselves, the group enlists the services of Police Detective Joe Cooper (McConaughey), a corrupt officer that has a thriving murderer-for-hire business on the side. Cooper comes with a set of strict rules for business, one of which is that he gets paid up front in full that Chris and Ansell find out about upon meeting the man. Not getting the money, and despite his own rule, Joe becomes enthralled with the beautiful yet simple minded Dottie and proposes that she become a retainer on funds due. Dottie agrees, very reluctantly and without a lot of notice from Chris and Ansell, to the terms set forth by Cooper leading to a very sensual private dinner between Joe and Dottie. Of course things don’t play out as planned and Chris is left trying to scramble to find a way out for his now infatuated sister, whom he may or may not be obsessed with himself in a very non-brotherly way. And the already dangerous Cooper proves just how dark he can get. Killer Joe is a very disturbed little film. The script from Tracey Letts does not fear to go where most movies would not. Equal parts wit, kink, and melodrama, Killer Joe takes a simple premise and does something completely original with it. The dialogue is original and crisp; a well-developed script that does contain a predictable twist towards the end, but the manner in which this twist is presented is both uncomfortable and hilarious at the same time. McConaughey is brilliant in the film. His Joe has a menacing nature in every moment he is onscreen, explosive and destructive in the blink of an eye, yet doting on the simple Dottie. Speaking of Dottie, Juno Temple does everything she can to steal this movie from McConaughey. Her performance mesmerizes you when she is onscreen. Temple has been putting together a great string of films and is definitely someone to keep an eye on. The rest of the cast also puts in some solid work, with this probably being the best thing I’ve seen Gershon in the last 10 years. The setting and set design resonate the desperation and broken down dynamic of the family at its core. Friedkin is a master at ratcheting up tension and not letting up when the audience is ready to let go, but exactly when he feels like it, which is epitomized by the final act of the film – it’s relentlessness. You’ll never look at KFC the same way again. 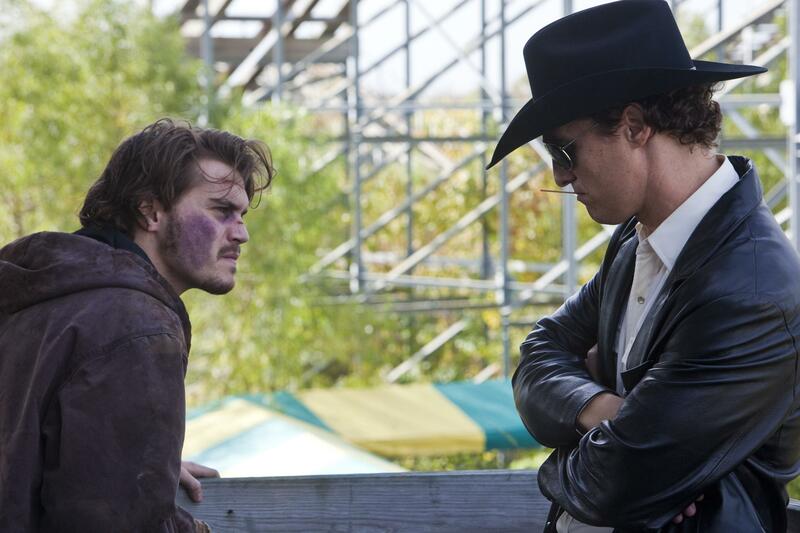 Killer Joe is a brutal and unflinching dark comedy that is also hilarious. Friedkin should be applauded for realizing his vision and doing it so unflinchingly. If you can handle it, Killer Joe is a definite recommend. 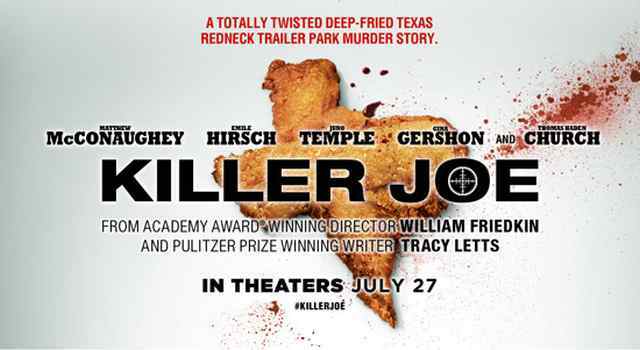 Killer Joe starts, hopefully in a theater near you, this Friday Aug 10th. Check your local theater listings for details.